These are the adorable pictures of the latest addition to a family of armadillos, small enough to fit into your breast pocket. The unnamed baby armadillo is the size of a tennis ball, which may sound petite but it has almost doubled in size since it was welcomed to the world two months ago. 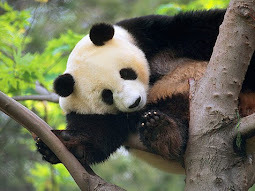 Born the size of a golf ball to proud parents, Zowie and Ollie in June, he has been the centre of attention at Florida's Busch Gardens animal park. Rangers in the Jambo Junction area of the family park in Tampa Bay, Florida are keeping a watchful eye on the eight-week-old Three Banded armadillo for now, but once the baby reaches 72 days old, it will be strong enough to survive without its mother's milk and ready to explore the park on its own. 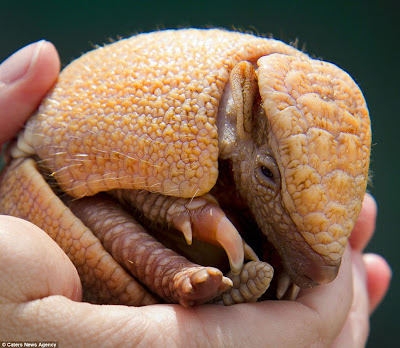 When the armadillo was welcomed into the world he was blind and could easily fit into the palm of a hand, but he has quickly learned to walk and close its shell and has a tasty appetite for ants and termites, which it scoops up with its long sticky tongue. The armadillo will continue to grow, but will only get slightly bigger until it reaches the size of a soft ball. 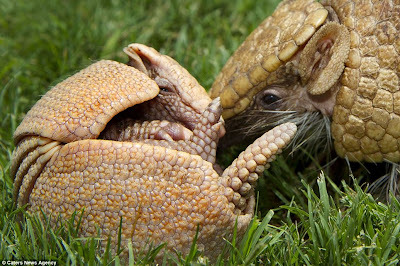 Three Banded armadillos are native to South America and they are the only species of armadillo who are capable of rolling in to a ball to protect themselves from bigger predators. 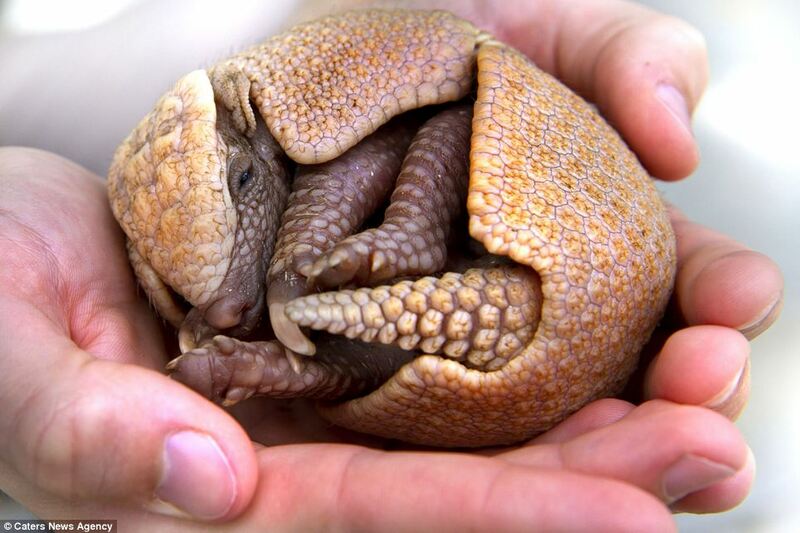 On top of that, armadillos are protected by their leather armoury shell made of tough keratin and the three types of banding on its shell allow it to fit its head and tail together underneath the shell. Staff at the animal park is still puzzling over what to call the little rascal and are looking for suggestions from visitors to name the third member of the Three Banded Armadillo family.